TheCassini spacecraft has revealed that Saturn's icymoon Enceladus has a significant atmosphere. Thespacecraft unlocked the moon's secret during recent flybys, NASA's JetPropulsion Laboratory announced Wednesday. Scientists, using Cassini's magnetometer instrument for their studies, said thesource may be volcanism, geysers, or gases escaping from the surface or theinterior. WhenCassini had its first encounter with Enceladus on Feb. 17 at an altitude of 725 miles (1,167 km),the magnetometer instrument saw a striking signature in the magnetic field. OnMarch 9, Cassini approached to within 310 miles (500km) of Enceladus' surface and obtained additionalevidence. Theobservations showed a bending of the magnetic field, with the magnetospheric plasma being slowed and deflected by themoon. In addition, magnetic field oscillations were observed. These are causedwhen electrically charged (or ionized) molecules interact with the magneticfield by spiraling around the field line. This interaction createscharacteristic oscillations in the magnetic field at frequencies that can beused to identify the molecule. The observations from the Enceladusflybys are believed to be due to ionized water vapor. "Thesenew results from Cassini may be the first evidence ofgases originating either from the surface or possibly from the interior of Enceladus," said Dr. Michele Dougherty, principalinvestigator for the Cassini magnetometer andprofessor at Imperial College in London.In 1981, NASA's Voyager spacecraft flew by Enceladusat a distance of 56,000 miles (90,000 km) without detecting an atmosphere. It's possible detection was beyond Voyager's capabilities,or something may have changed since that flyby. Thisis the first time since Cassini arrived in orbitaround Saturn last summer that an atmosphere has been detected around a moon ofSaturn, other than its largest moon, Titan. Enceladusis a relatively small moon. The amount of gravity it exerts is not enough tohold an atmosphere very long. Therefore, at Enceladus,a strong continuous source is required to maintain the atmosphere. Theneed for such a strong source leads scientists to consider eruptions, such asvolcanoes and geysers. If such eruptions are present, Enceladuswould join two other such active moons, Io at Jupiter and Triton at Neptune. "Enceladus couldbe Saturn's more benign counterpart to Jupiter's dramatic Io," said Dr.Fritz Neubauer, co-investigator for the Cassini magnetometer, and a professor at the University of Colognein Germany. Sincethe Voyager flyby, scientists have suspected that this moon is geologicallyactive and is the source of Saturn's icy E ring. Enceladusis the most reflective object in the solar system, reflecting about 90 percentof the sunlight that hits it. If Enceladus does haveice volcanoes, the high reflectivity of the moon's surface might result fromcontinuous deposition of icy particles originating from the volcanoes. Enceladus' diameter isabout 310 miles (500 km), which would fit in the state of Arizona. 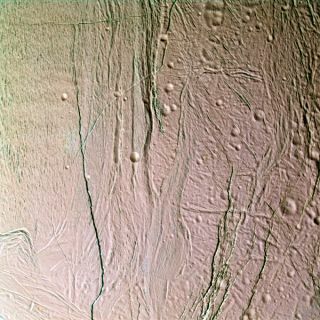 Despite its small size, Enceladus exhibits one of the most interesting surfaces ofall the icy satellites.